Century Cycles Blog: First Night Ride is this Saturday! Everyone I talk to has two topics they want to discuss -- the Cavs and the weather forecast for this weekend. Even more unusual for Cleveland, both look very promising. 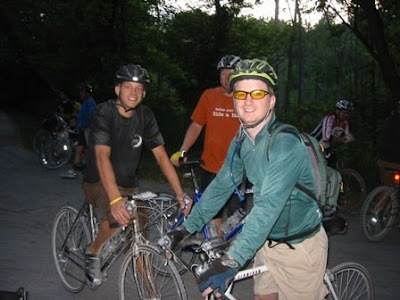 It's those 70-plus-degree temperatures on Saturday that make it the perfect evening for our very first Night Ride on the Towpath Trail of 2009. Scott and Doug are leading the ride, and most likely leading the march next door to the Lizard upon the ride's conclusion. Plus what else you gonna do? The Cavs ain't playing that night. I had the greatest time at my first night ride. Everyone is so friendly. Greatest thanks to Debbie and Petch, I now have a new hobby!! !